. . . and what they mean for your home! While our expertise is building homes with timeless appeal, we always have an eye out for trends that can lend a refreshing note. This spring High Point Market in North Carolina introduced furnishings that will make their way into stores next season. We see a leaning towards products that express a strong personal point of view. 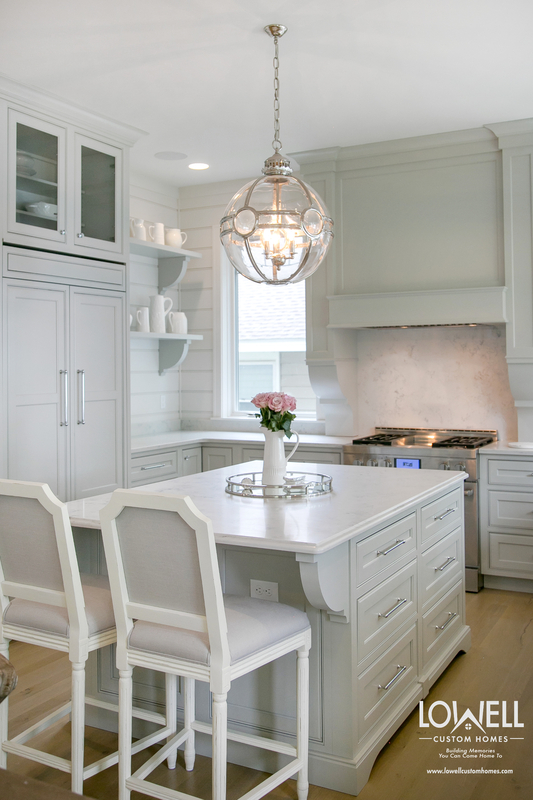 Here are a few of the standout trends and what they mean for home design. Applied to your home, this means traditional shapes with a clean modern edge. Here we show the look in a library with classic details refined by a linear perspective . At home this trend is expressed with a more casual mix of materials like rustic stone on the fireplace, finely detailed woodworking and a mixed media chandelier. Components with an artisan touch are more and more popular at home. This hand hammered copper freestanding bathtub will develop a patina to accompany its sculptured shape. To see the entire home click here. Natural elements are a major influence in decor and construction. This kitchen island stands out with a scraped and distressed natural wood countertop by Grothouse from Geneva Cabinet Company, LLC in Lake Geneva. To enjoy this entire home click here. Thankfully the era of the accent wall is over. 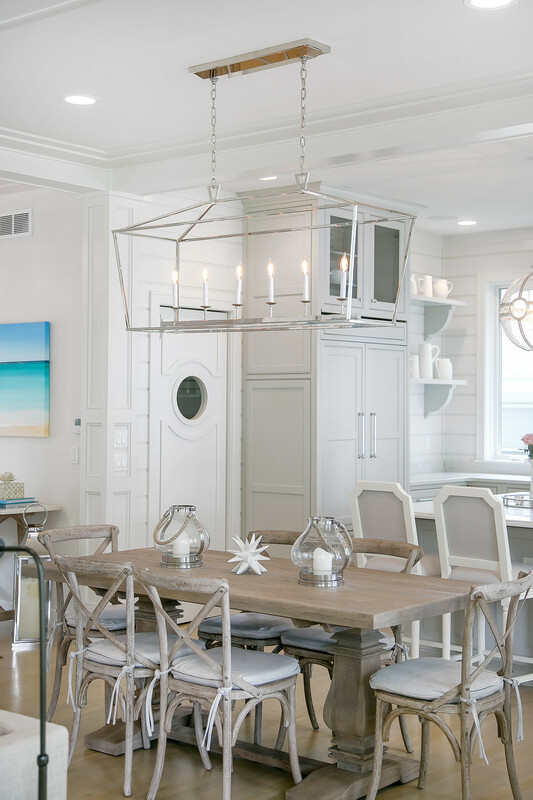 We are no longer afraid to experience strong color either skillfully wrapped around the walls or artfully applied to cabinetry and furniture, as demonstrated in this lovely home. You can see the rest of the color story by clicking here. Some of our favorite pieces are highlighted on this mood board, follow the numbered links for source information. For more inspiration visit Instagram for High Point Market. One of our past blogs described how a home can hold the secret to happiness (read more about that here). One last part of the process is establishing a personal point of view, these latest trends will help with that. We always love hearing from you and are happy to discuss your personal home projects! Building a new home or remodeling can be an exciting adventure and our team of experts is available to answer your questions and guide you every step of the way! It turns out the key to happiness and the key to your front door is one in the same. Latest findings point to the well designed home as a significant factor in leading your best life. 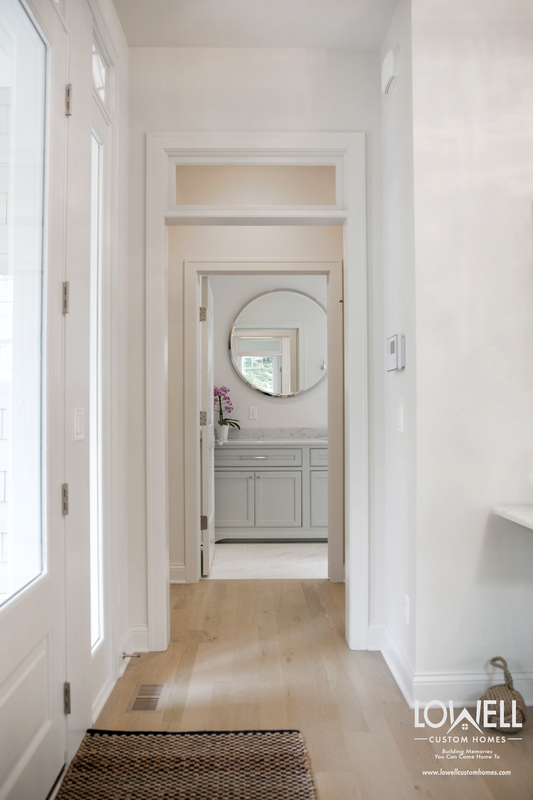 Home should be a sanctuary of self-care, and the team at Lowell Custom Homes has a few ideas to help you make that happen. Most of our leisure time is fragmented by interruptions from an email, text, or simply caring for others. Since you cannot make more time, it makes sense to make the most of it. That’s where the homes from Lowell excel. Their forward thinking floorplans and distinctive features conserve your time and energy. Known for interiors that weave spaces together seamlessly, our homes will help you move efficiently throughout the day. Nothing invites happiness like a well designed entry. From landscaping to architectural details, this is where the journey begins. Our video explains the artistry behind the entry doors in this show-stopping home, with Lulu Belle and Tucker extending a warm welcome. You cannot make more time, but “time deepening” will make the most of what you have. Face-to-face interactions are an essential part of happiness. A home that supports togetherness can be more rewarding than screen time. We love open floor plans were the kitchen is at the heart of the home. When the layout is spacious and the appliances are luxurious, the kitchen becomes an ideal place for multitasking and gathering. Speaking of luxurious appointments, a range from La Cornue USA and custom hood by Raw Urth turn this kitchen into a real happy place! Cabinetry by Geneva Cabinet Company. The den can be another favorite setting for togetherness. This room wraps you in the warmth of knotty alder with its architectural barrel vault ceiling for an intimate cocoon. A recommended approach to happiness is to decelerate and enjoy the ride. 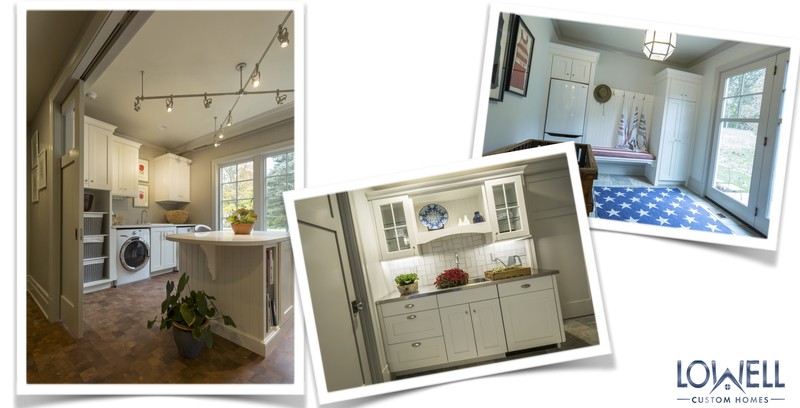 Home design should accommodate a variety of interests with space to rejuvenate. 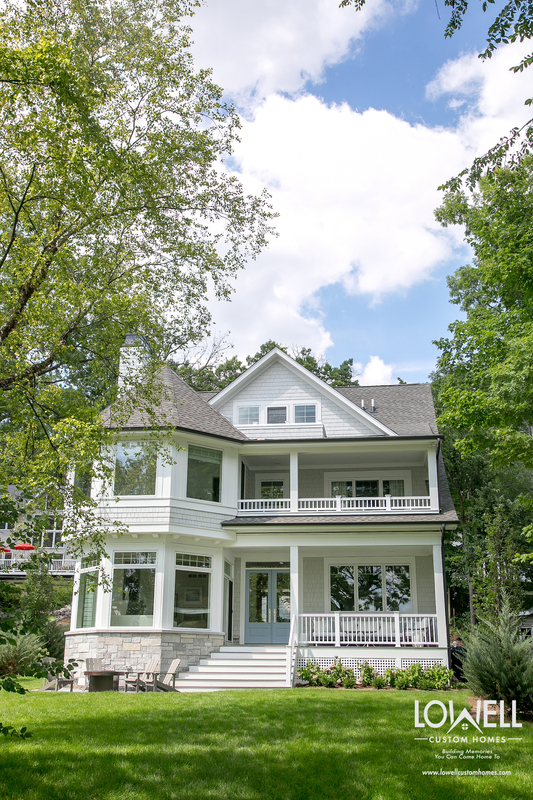 We think you’ll enjoy a tour of the specialty areas in this newly completed Lake Geneva area home. The workout room is located on the main floor for top of mind awareness. A master bath exudes luxury with the positive energy from copper finishes. 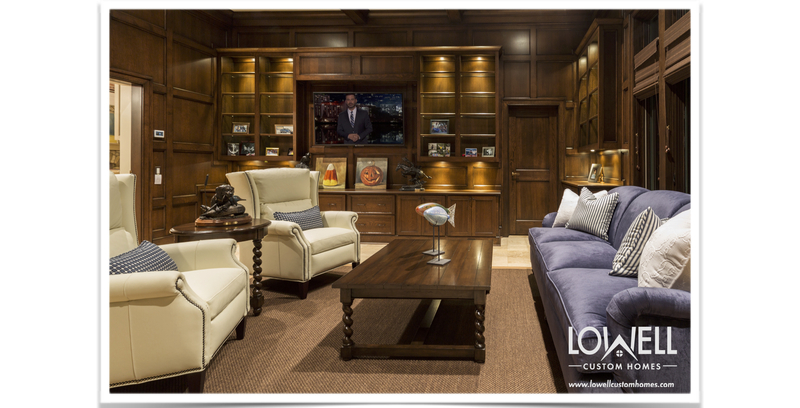 We are reminded of the great satisfaction of having guests when we browse the entertainment areas of this home. A nautical themed bunk and bath is perfect for Lake Geneva weekends. To see more of our favorite bunk rooms click here. And for tips on caring for your guests click here. Even the tiniest guest receives a special place for precious overnight visits. Did we leave anything out of this remarkable home? Oh yes, the wine cellar and sauna! 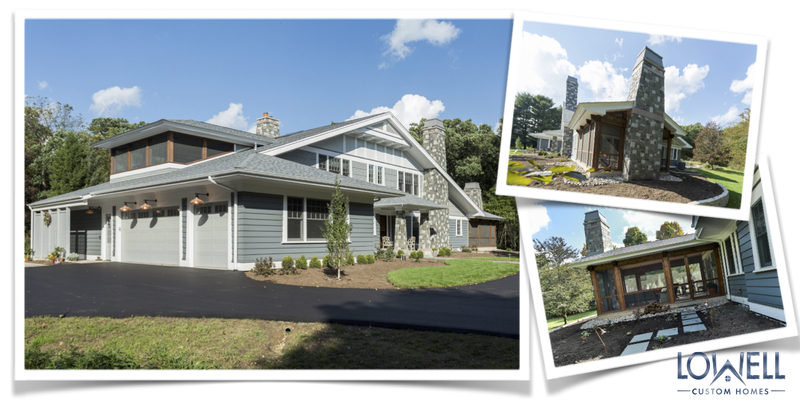 The home in this blog was featured on an interview with Todays Builder Television Show where builder Scott Lowell explains his “old-school” building methods that maintain the highest quality. Take a peek . . .
We believe in homes that are built to save you time, encourage togetherness and provide lasting contentment. We invite you to read the reviews from our happy homeowners right here. From the Gates of Paradise in Florence to Monica’s framed peephole on Friends, the entry door has always told a story. It is an essential element in your home’s first impression and can add significantly to the value. The material used on this interior-exterior element will impact your home’s energy-efficiency as well as style. Doors are available in a variety of mediums, like wood, fiberglass, steel and composite materials. But this video will demonstrate why we favor a beautifully crafted wood door. In addition to the entry of this home, it’s important for the warmth and style of the entry door to be reflected on the adjacent garage. Another lovely pairing expresses this same harmony with a carriage house aesthetic. This Craftsman Style home is a stunning example of how doors can express architecture with something as subtle as the grid pattern. When it’s all about the view, glass panel doors will reflect the natural surroundings via their mirror-like surface. Going Dutch will allow you to have a friendly open door policy. Once you have a door selected, add a bit of art in the form of a door knocker to truly make it your own! You can take a personality test to determine the perfect color for your front door by clicking here. To see more ideas for your home’s entry check out our Inviting Entries Ideabook on Houzz by clicking here. 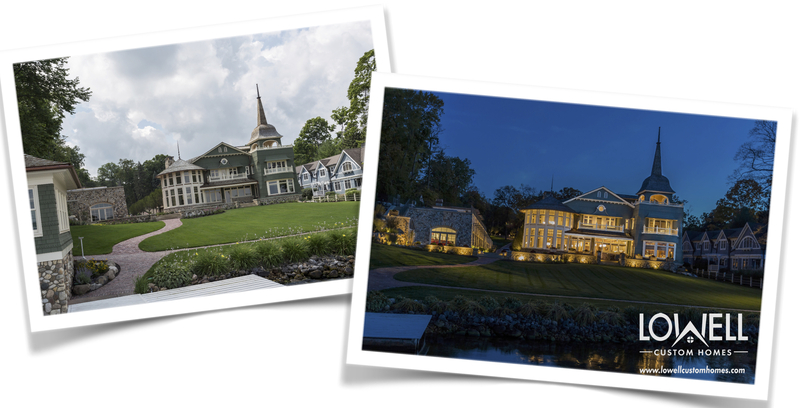 If you love our homes, please take a minute to Vote for Lowell Custom Homes as the Best of Walworth County! We would deeply appreciate it! Best New Home Builder & Best Home Remodeler. Be sure to pick at least 10 of your favorite Walworth County businesses to be entered to win an Amazon Echo. Battle of the Bunks – Bunk Beds and Bunkrooms defeat the blow-up mattress! The latest trend making its way into the most stylish homes of Lake Geneva is reminiscent of pillow fights and childhood sleepovers. Bunk beds and even bunkrooms are becoming the guest quarters of choice. There is an appealing social factor to this trend that blends sleeping arrangements with the ability to spend quality time together. You are never too old for a sleepover! Even boutique hotels are introducing bunk options. Not only is this attractive to families, but the luxurious feather bedding and 300+ thread count sheets draw big kid pajama parties and friend getaways. 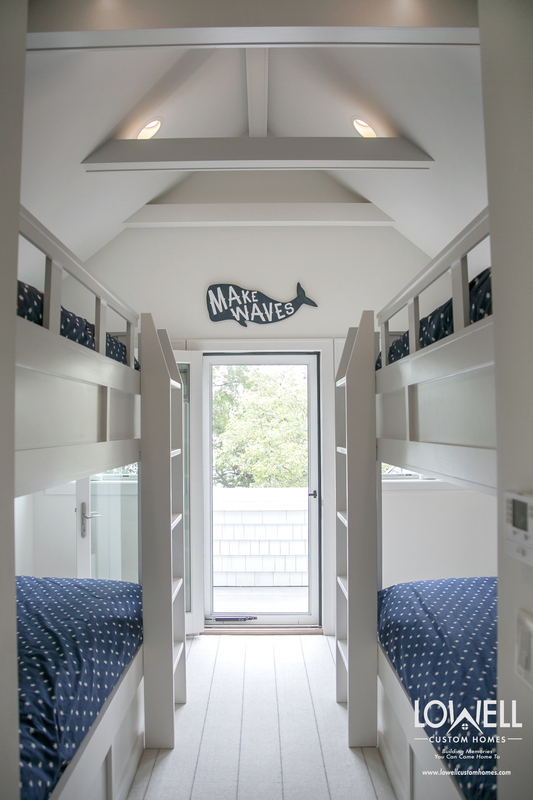 For the Lake Geneva homeowner, bunks are the best way to maximize space without compromising style. Children, grandchildren and long-lost cousins can all have a place to rest for round-the-clock togetherness and good times. Which bunk bed concept is the best fit for your home? Let’s look at the possibilities . . .
An open and airy space with built-in bunks will transform one bedroom into a space for 4 – 6 houseguests. Keep the base bunk low to allow extra headroom for your full-grown bunkmates. Playing with themes can add an element of intrigue for your guests. We created enclosed bunks with The Design Coach, Phillip Sassano, to be more Orient-Express than summer camp. Each is like a mini room with privacy curtains, storage and individual lighting, all wrapped up in plushy velvet comfort. Unused space can be transformed into a guest area when fitted with freestanding or built-in bunk beds. Consider an open niche, attic space, or even a generous hallway that can be lined with bunks. Each cozy little cocoon will attract kids of all ages when it’s time to take a snooze. Encourage camp-like comradely, minus the swirlies, with an adjoining locker and shower room. 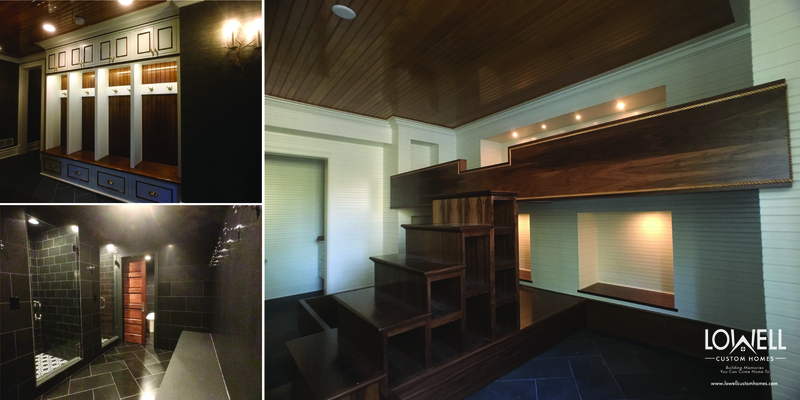 Beautifully detailed bunks feature specialized lighting and easy access steps instead of a ladder for ageless appeal. We have a dedicated staff of professionals including an AIA architect, Interior Designers & Construction Superintendents who are all pleased to help you with your home projects! 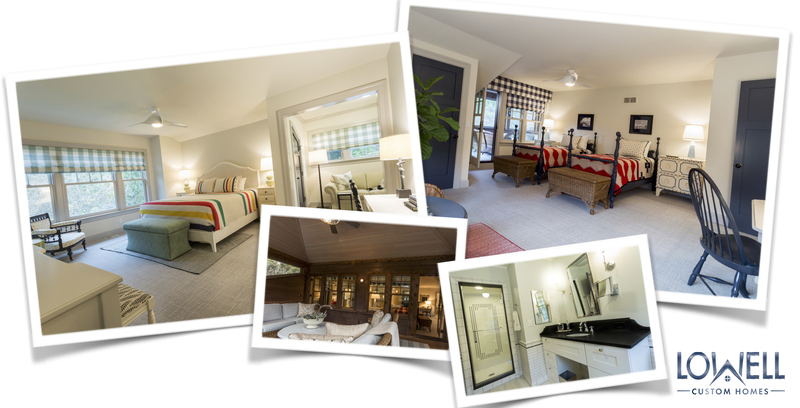 https://www.lowellcustomhomes.com/wp-content/uploads/2017/05/Bunks-Lowell-Custom-Homes-.jpg 672 697 Lowell Custom Homes /wp-content/uploads/2018/02/lowell-custom-homes-logo-250.png Lowell Custom Homes2017-05-25 23:41:122018-08-31 16:59:39Battle of the Bunks - Bunk Beds and Bunkrooms defeat the blow-up mattress! The great outdoors is calling. Alfresco dining, entertaining friends or just lounging under a clear sky . . . the best home design will create gracious indoor-outdoor living space where you can truly embrace the spring and summer months. 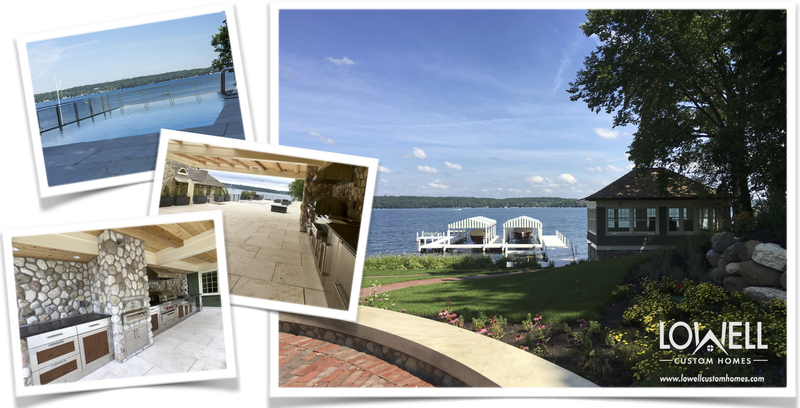 Get inspired by stunning outdoor ideas from these Lowell Custom Homes, and then create a space to complement your personal indoor-outdoor lifestyle. Align interior and exterior spaces for a seamless extension of your main living area. A fluid transition between indoor and outdoor rooms can be created with a disappearing wall of glass doors. An easily accessible patio will draw everyone outdoors, enlarge your living space, and extend your spring and summer season with gentle protection from the elements. Balance your options with both open and intimate space. Just as a good interior space plan will provide areas for private and social activities, your outdoor rooms can offer alternatives that adapt to your needs throughout the day. Sun vs. Shade – Active vs. Restful – Entertainment vs. Retreat. You select the most suitable outdoor environment to match your mood. Get in position to enjoy the view. Use your natural surroundings to create a focal point. Arrange outdoor furniture where everyone can appreciate the scenery. A beautiful garden, swimming pool, or outdoor fireplace can all serve as appealing points of interest. Locate zones on your property according to use. No need to cram all outdoor living space against the house. Just anchor each zone with its own useful focal point. 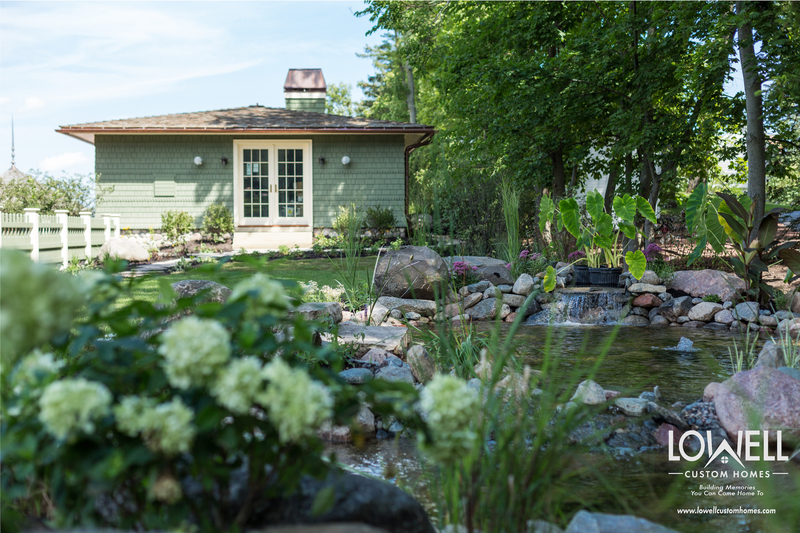 A boathouse services lake front activities, a cabana offers poolside convenience and an upscale shed will store hobby or gardening equipment. Create an outdoor hub where essentials are clustered for convenience. Food preparation, dining table and entertainment equipment in one outdoor zone will let you enjoy the fresh air while hosting friends and family. 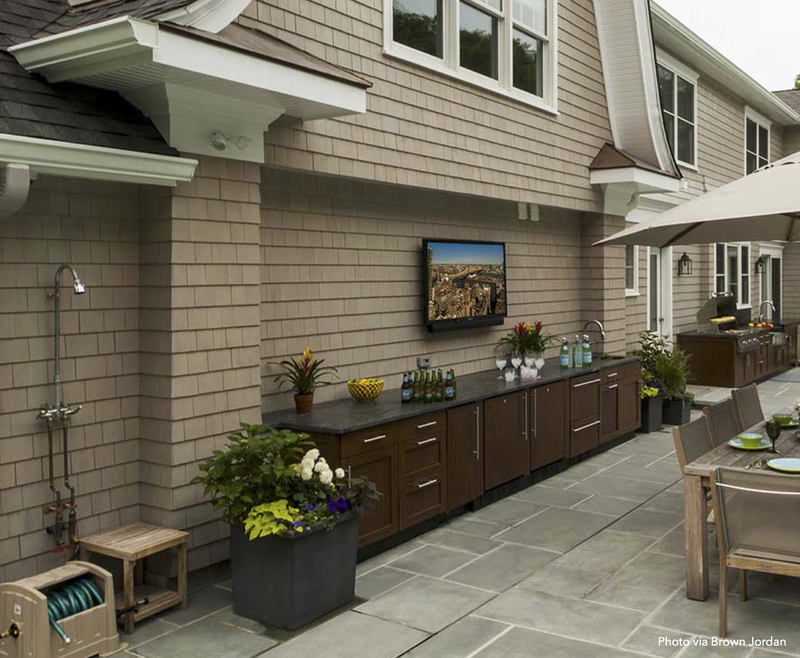 An outdoor shower and self-serve refreshment bar can eliminate messy indoor traffic patterns and keep your home tidy. Introduce a fire feature to cozy up your outdoor space after dark. S’mores and story telling around the fire pit or outdoor fireplace will create memories and start traditions to be passed on for generations. Dress up your space with weather resistant products to compliment your indoor style and color palette. Create visual interest with light fixtures, fans, area rugs, and accessories to add indoor comfort to your outdoor experience. The experts at Lowell Custom Homes can help you plan a home with the most natural flow between your indoor and outdoor environments. We love the direction home design is taking and you will too! The special features we are building into homes are all about enhancing lifestyle. Say goodbye to cookie-cutter plans and welcome in the latest features that will have real staying power for your new or remodeled home. Pick and choose exactly what makes you smile. 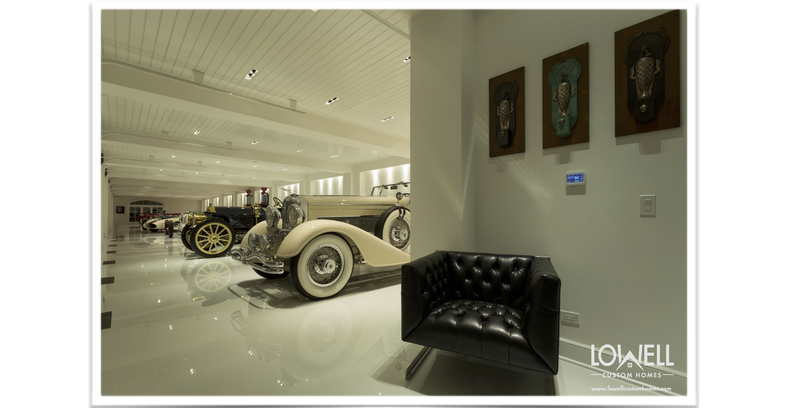 This home for an avid auto collector creates a showcase where it can be enjoyed and shared effortlessly. Forget neatly stacking your treasured collections in a closet; use these special interests as a springboard for developing a home style that is meaningful to you. We have always designed homes to be appreciated from every perspective, and now the appeal for 360o detailing is catching on. When equal attention is given to the side and back elevations, your everyday home experience becomes richer. While you’re at it, be sure stunning architecture does not get lost in the shadows. Landscape and exterior lighting is an essential element for any home plan. Natural charm and flow characterize kitchens today where we like to cluster cabinet storage along one wall to keep the floor plan open and accessible. Popular Farmhouse and Industrial trends merge to create highly functional spaces for living and entertaining. Materials here and throughout the home blend natural honed surfaces with polished finishes. The interplay of texture is spellbinding and creates the perfecting setting for gatherings. Smart features go undercover while serving up substantial savings. Energy efficient windows and insulation work with zoned heating and cooling systems to maximize a homes mechanical productivity. Automated and voice-activated systems monitor comfort levels with the added convenience of off-site monitoring. We work hard, so creating playful outdoor space at home lets everyone enjoy free time without traveling to another location. 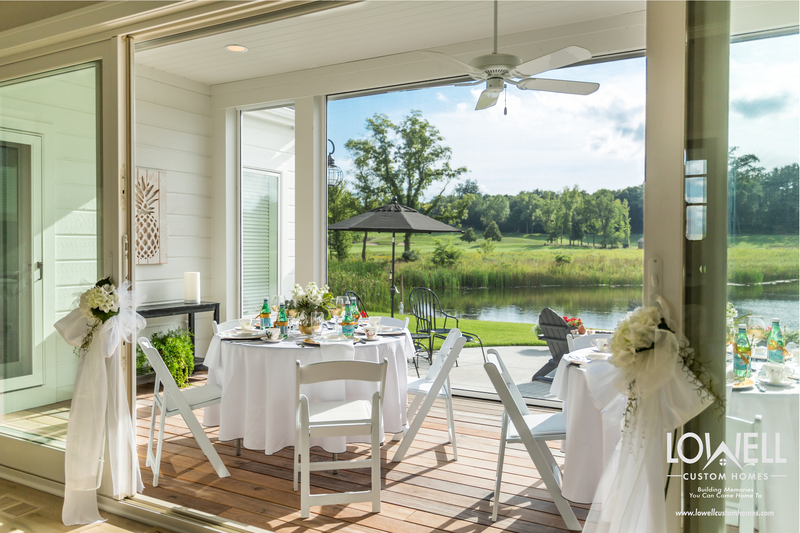 Screened-In porches and outdoor kitchens are often joined by even more personalized features like putting greens and movie screens. At home entertaining is on the rise and a central hub allows the host to be a part of the action. Whether your preferences leans towards a fully stocked cocktail bar, coffee bar or ice-cream social bar, the mission is convenience. A dedicated area with storage and proper supplies will turn a simple beverage into a special indulgence. HGTV and Pottery Barn may have caused you to forget about the warmer side of the color wheel, but that is about to change. Cool grays will still be important, but neutrals will move forward by including warm beige tones and occasionally a bit of brown. The freshest effects will be achieved when these colors are accented with saturated hues like Benjamin Moore’s 2017 Color of the Year – Shadow, and Pantones 2017 Color of the Year – Greenery. Luxury takes a turn towards practical when it comes to indulging ourselves at home. Oh sure, a spa bath is nice, but nothing compares to a laundry room with a potting station or a mudroom lined with exquisite locker storage. Those highly functional areas can be fitted to perfection turning everyday chores into a delightful escape. Interior Design for the laundry room and potting area featured in the last image and the Beverage Bar with metallic tile backsplash is by Elizabeth Drake of Drake Interiors, Ltd.
A well designed home has staying power. It transcends a specific architectural style to focus on an emotional connection, lifestyle and comfort. The secret to creating this type of timeless design starts with a collaboration of experts who truly understand the homeowner’s aesthetic. 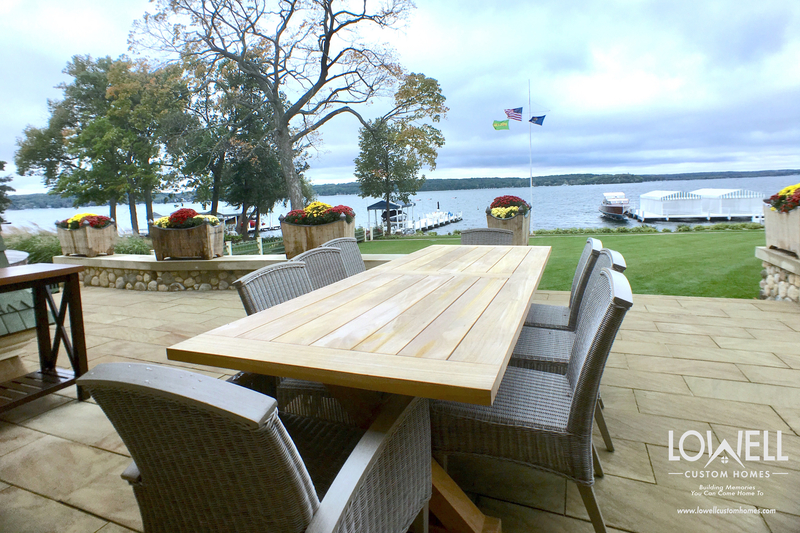 This getaway home embodies the relaxed Lake Geneva lifestyle while integrating the homeowner’s appreciation for tradition and creativity. 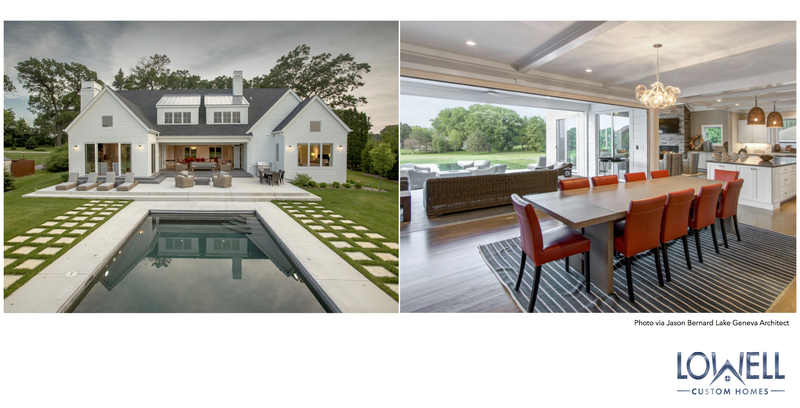 We worked with Architect John A. Hagenah and Interior Designer Elizabeth Drake as well as our talented craftsmen and quality resources to build a home that is both timeless and inviting. The Craftsman architecture utilizes wide gabled rooflines, tapered stone columns, and minimalist ornamentation for an intriguing relationship with the countryside. Cedar shingles and horizontal siding introduce subtle pattern with gable details that expose rafter beams. A screened in room and sleeping porch provide protected connections to the outdoors. The back elevation of the home features a wall of windows and French doors where indoor-outdoor activities can flow effortlessly. 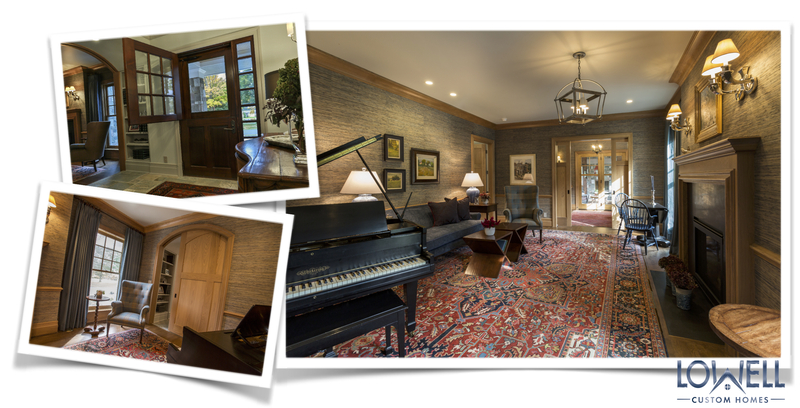 The entry features a Mahogany Dutch Door inviting guests to the refined elegance of the Music Room. Classic lighting and traditional woodworking are relaxed with the warmth of grass cloth wall covering and medium wood tones. Use Neutrals or Classic Colors for Permanent Elements, Have Fun with Easy to Alter Elements. 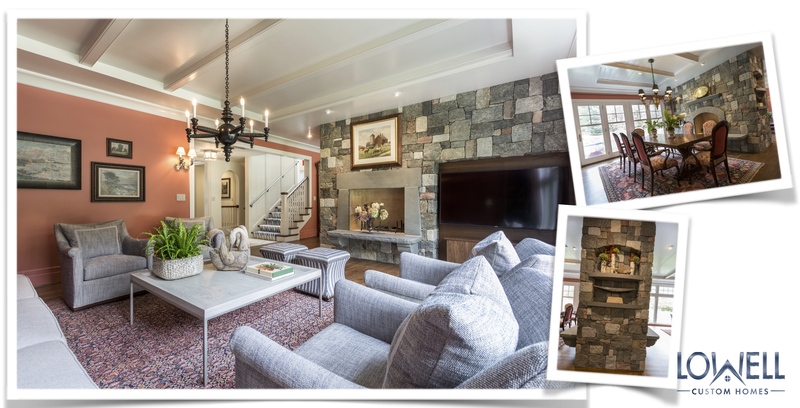 The living room relies on Craftsman elements for its inviting character created with the low profile of a beamed ceiling, custom stone mix on the fireplace wall, stone mantel and conversational seating area. All of the permanent architectural features in this home are timeless, neutral, and versatile. The dramatic surprise of coral paint for the walls is actually an on trend element that can be easily changed should the homeowners ever feel the need for a different mood. 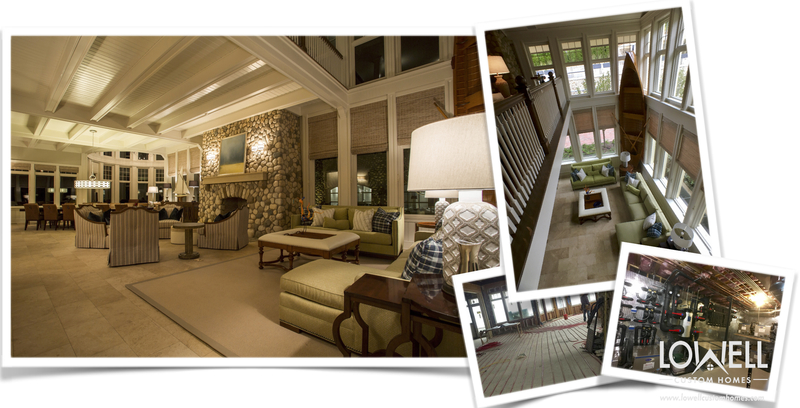 The dining room is adjacent to the entry hall and features another stone fireplace. 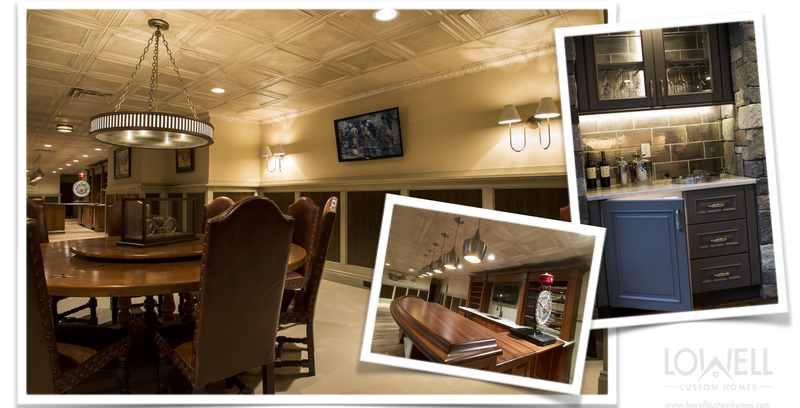 Coffered ceiling and traditional moldings step up formality that is then relaxed with the rustic texture of stone. 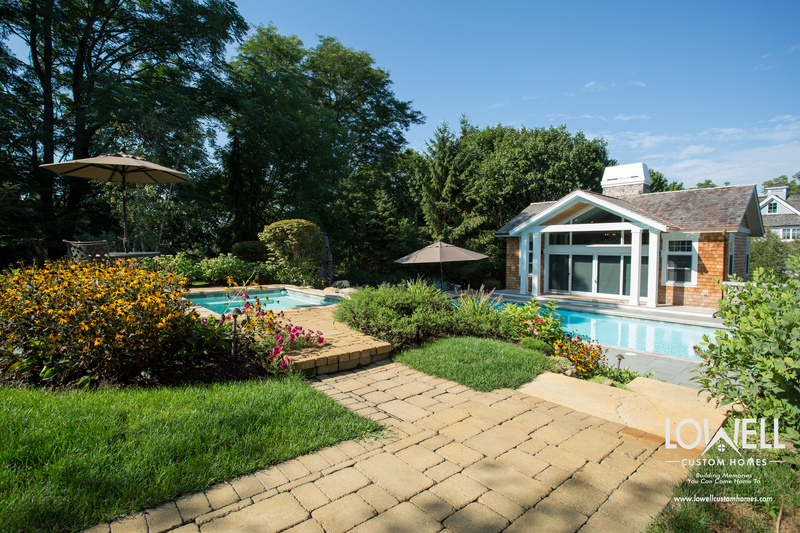 A built-in wine and refreshment bar is located at this mid-point of the home for easy entertaining with a convenient connection to the outdoor pool area. The dining area of this open floor plan flows directly to the kitchen with its large island seating for casual dining and entertaining. 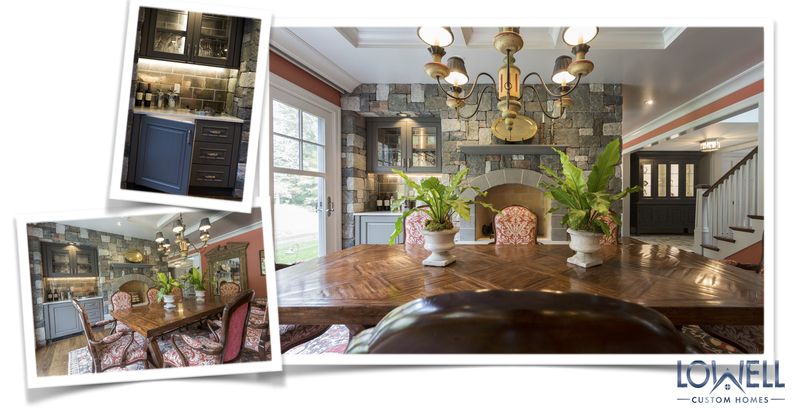 Here Wood-Mode cabinetry from Geneva Cabinet Company, LLC is done in a custom color with Quartzite countertops. Appliances include a Wolf range, Miele Oven, Steam Oven, Warming Drawer, and Sub Zero refrigerator. 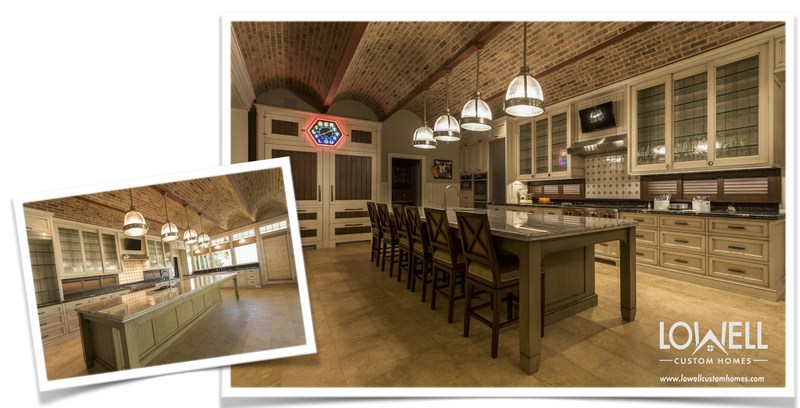 An artistic tile backsplash from Bella Tile and Stone, grounds this area with handcrafted appeal. 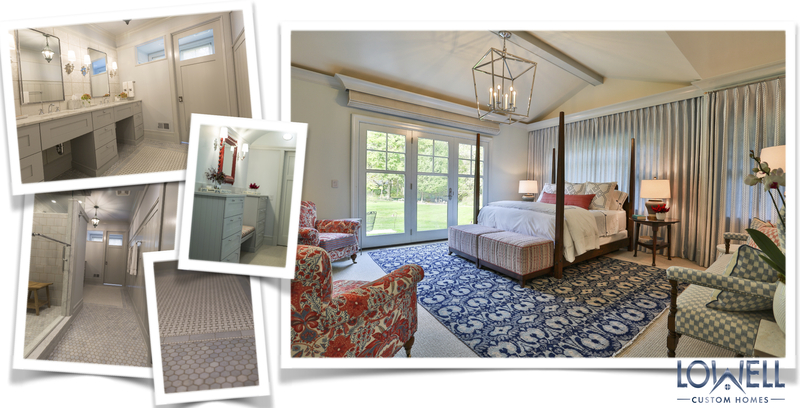 The first floor Master Bedroom Suite is a key feature for a timeless home plan. This area is designed with such grace and style that you may not notice the accessibility features that allow for future aging-in-place. The compartmentalized Master Bath, with double vanity and spacious shower, is detailed with classic tile patterns using basket weave and hexagon mosaics. Interior windows provide shared light and privacy while a tiled wall performs as an easy to maintain backsplash for the vanity area. The Guest Suites include bathrooms for privacy and access to the second story Sleeping Porch. Each suite features a seating area and a full wall of windows for natural lighting , ventilation and views of the countryside. Even the highly functional spaces of this home are treated with timeless details and easy transitions to the outdoors. 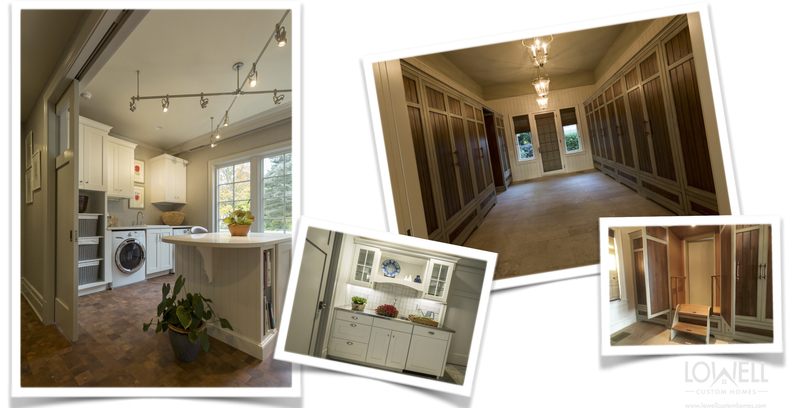 A clever open combination space blends the laundry, creative studio and mudroom. It includes a workstation with stainless steel countertop and sink that can serve as a Butler’s Pantry or potting area for gardening. Another space with direct access to the pool performs as a cabana like dressing room with stacked washer/dryer and locker storage. 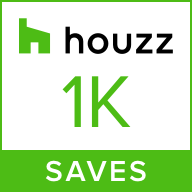 You can see more of this beautiful home with larger detail pictures on Houzz. Flashback October 2015: Benjamin Moore names Simply White as the Color of the Year and we experienced a visual cleansing of the palette. We were swept away with the elegant simplicity of white. But this year, to remind us that there is no one-size-fits-all solution; Shadow, a deep amethyst, is named the 2017 Color of the Year. It is a sultry hue that will drive our sensibilities in a new direction for 2017. Don’t worry if you’re not the dark brooding type, there is a full palette of complimentary colors introduced by Benjamin Moore to work beautifully with Shadow. And those of us who are clinging to the light airy ambiance of white will be pleased to note that it has not disappeared from our color radar. While Benjamin Moore uses a dramatic entrance photo to entice us with Shadow’s moody nature, don’t let it frighten you. This sophisticated color can be introduced in small ways for an on-trend update. In fact the complex color composition of Shadow allows it to act as a neutral to be paired with colors you may already have at home. The complete 2017 color direction includes delicate hues that can be accented by the gem stone qualities found at the deeper end of the palette. If you love drama, go ahead and wrap a room in you favorite passionate shade. For those of us who can’t commit, refresh your colors with accent and accessory pieces. We’re not telling you to be a slave to fashion, in fact we love the classics. Think of this as a heads-up for colors that will be popping up in stores in 2017. Use what you love and give the others a knowing nod of recognition. Remember, every color and idea we know as a classic, began as a trend. 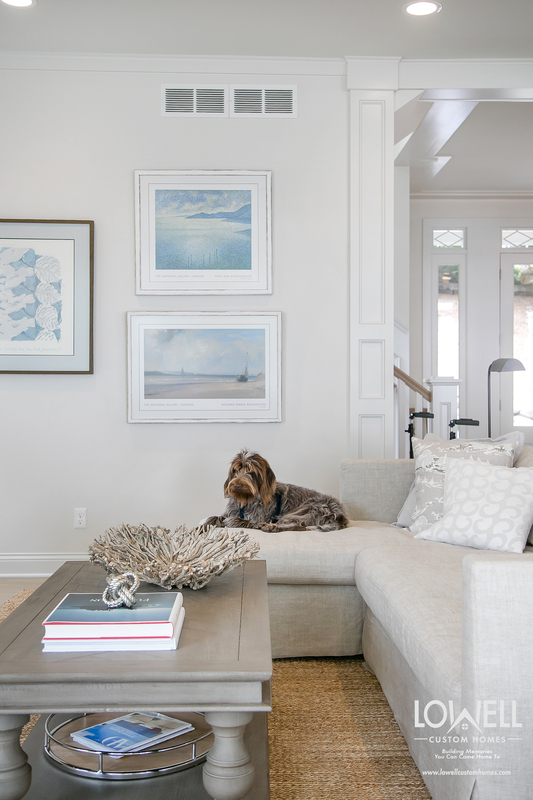 Adjust your eye to Benjamin Moore’s Shadow by introducing artwork, area rugs or an accessory piece for an instant update. The entry door is an ideal place to go deep for major impact. If you are completely infatuated with the 2017 palette, make a stronger commitment with granite, tile or cabinetry. This selection of cabinet finishes from Wood-Mode is available from Geneva Cabinet Company. They are true classics that take on a trendy attitude when paired with Shadow and the other deep companion hues. 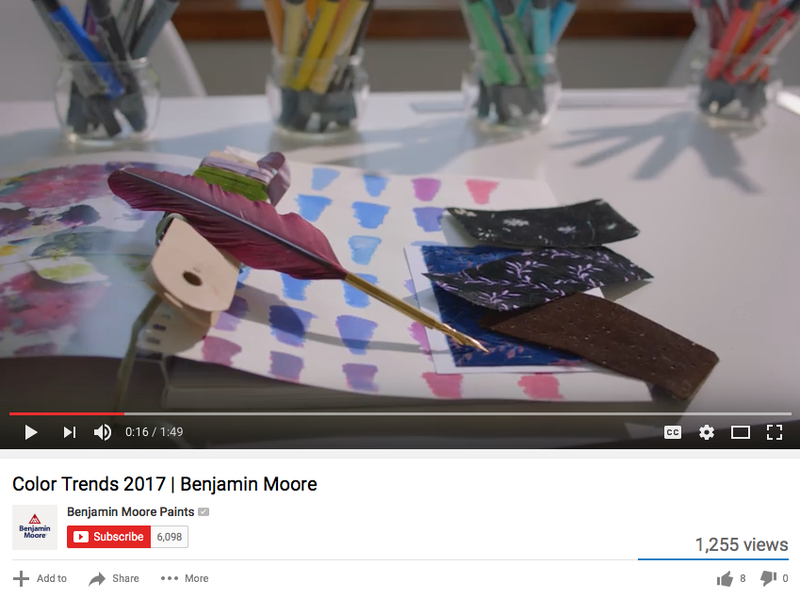 Benjamin Moore shares this video to explain some of the research behind this year’s choice for Color of the Year. When you build or remodel with Lowell a team of experts will guide you through every detailed decision. Whether your style is timeless or trendy, our AIA architect and interior designer will support you with the latest updates and information for everything from architecture to color. 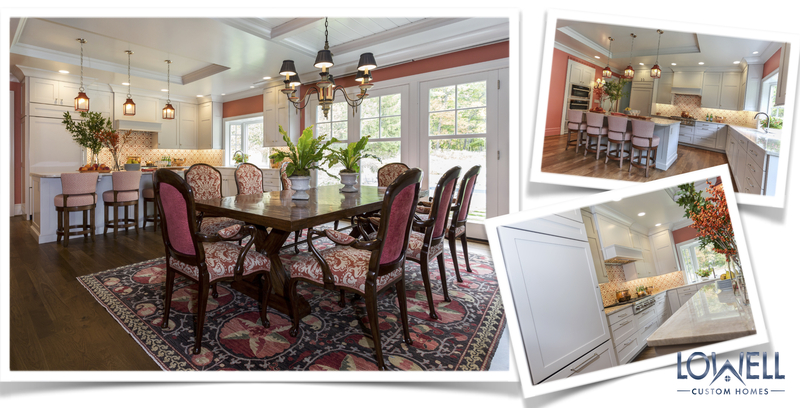 Click here to tour this remarkable Lowell Custom Home! Take a minute to enjoy a video tour of one of our custom homes on 336 acres surrounded by a 1000 acre nature preserve in Wisconsin. This property includes a 9,000 square foot main house, a guest house the sleeps six, tennis courts and a lighthouse clubroom.